SciFi Channel has announced the summer schedule. A remake of Flash Gordon premiers on August 10. The third season of Doctor Who starts July 6. I’ll be out of town for the 4th of July holiday, but that won’t matter as by then I’ll have seen the full third season thanks to those kind people in Great Britain who faithfully upload each week’s episode the night it airs. While I haven’t verified the math, I’ve also heard that in the past week Doctor Who passed Star Trek for most episodes, counting all versions of both shows. I knew I’d love this week’s episode as soon as I saw the Tardis materialize at the base of the Statue of Liberty, followed by The Doctor and Martha walking through Central Park. 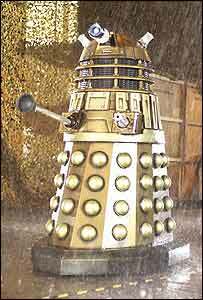 The episode ends with a cliff hanger as the Daleks present a new threat to make up for them being an endangered species. While I enjoyed the show, such time travel stories always present some problems. If the few surviving Daleks have come back in time to the 1930’s, this would be before most of them were wiped out and there should still be lots of Daleks out there. Of course the same could be said about the Time Lords being killed as there would still be ones roaming through time from before the war. Star Trek creator Gene Roddenberry will be inducted into the Science Fiction Hall of Fame in June. Studio 60 On The Sunset Strip returns on May 24 to air the six remaining episodes. As they were still filming the final episodes when it appeared clear the show had little chance to be renewed, hopefully they came up with a good ending for the show. Mitt Romney has come under a lot of criticism for his flip flopping (as seen in this video). When a Republican comes under criticism for anything, the standard response is to claim that Bill Clinton did it too, but that might not help Romney in his primary campaign. Therefore Romney had to break Ronald Reagan’s 11th Commandment and attack his fellow Republicans for flip flopping. Fortunately for Romeny, the criticism of the other Republicans is also valid. As a big-city mayor, Giuliani once advocated strong federal gun controls, including a nationwide mandate to register handgun owners. He now emphasizes the Second Amendment and state-by-state solutions to gun violence. Giuliani is a solid proponent of abortion rights. In the 1990s, he opposed a late-term abortion procedure but last week issued a statement praising the Supreme Court’s decision to uphold a ban on what critics call partial-birth abortion. The Democratic governor of New Hampshire, John Lynch, has said publicly that he will sign the civil union law. These videos on You Tube of John McCain might also be considered flip flopping. In the past, McCain spoke about rapidly getting troops out of Haiti and Somalia. To be fair, these might not be considered true flip flops because he was talking about different situations, but then the Republicans were never very fair to John Kerry when they went much further in twisting his positions to claim he was flip flopping. We report, you decide. Regardless of whether these are true flip flops, many of the statements McCain made with regards to getting American troops out of Haiti and Somalia would make excellent arguments against his current position on Iraq.